Before getting into this, allow me to get a bit personal. Many years ago, I had a netbook, a cheap laptop aimed for basic internet use and nothing more. The netbook’s lack of power and me being a teen without the autonomy or money to just buy things really limited my options to get games. So I looked around the Internet for free things that I could play that wasn’t from Newgrounds (I wasn’t really into the flash game scene), which led me to getting into RPG Maker games, and I’ve been in RPG Maker hell ever since. But I wanted more. And that’s when I read an interesting Kotaku article: a game called Anodyne was up on the Pirate Bay, which the creators stood by and used as promotion. I thought the game looked cool and if the creators were cool with it, I might as well go for it. 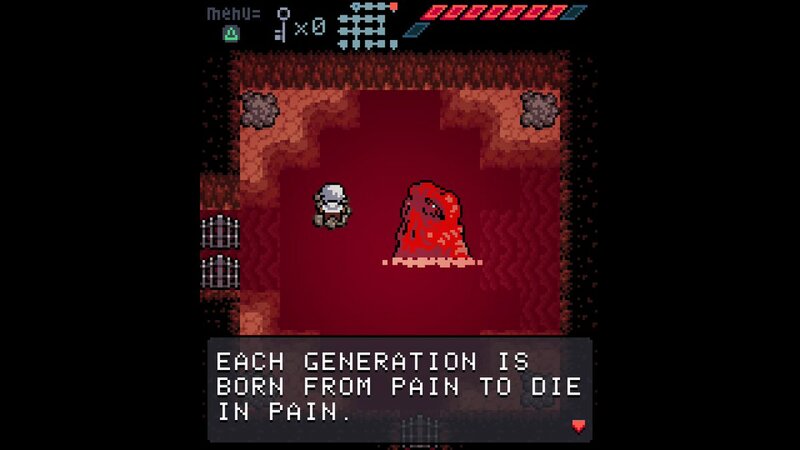 And so, outside of RPG Maker games, Anodyne became the first indie game I ever played. It’s a game that I hold close to my heart because it really showed me what a handful of people were capable of putting together. I remember reading through the game development thread a bunch. I remember reading through the Even the Ocean thread a few years later when it was still Even and Ocean. When I was able to buy things I finally formally bought the game off Steam and recently, I won a giveaway for the newly released PS4 port. Sure, I have a backlog and a bunch of e-mail requests to check out games, but if I’m getting one of my favorite games for free, you sure as hell can bet I’m on that. Anodyne is a game made by Analgesic Productions, consisting of Sean Han-Tani and Marina Ayano Kittaka (note: the opening credits uses a previous name she went by), with the PS4 port done by Nnooo. Anodyne throws you into the Land, the dream world of Young, a youth armed with nothing but a broom on a grand quest to save the Briar (maybe). If you’re a fan of the Gameboy Zelda games, you’d be at home with Anodyne, as it’s very Link’s Awakening-esque; in some ways, Anodyne feels like a more simplified version of those games. Young gets his broom – his method of attack and carrying around dust for puzzles – within the first few minutes of the game and the ability to jump within the first third. And that’s pretty much it for abilities. The only way to grow from there are health upgrades and optional items that just change the range of broom sweeps. 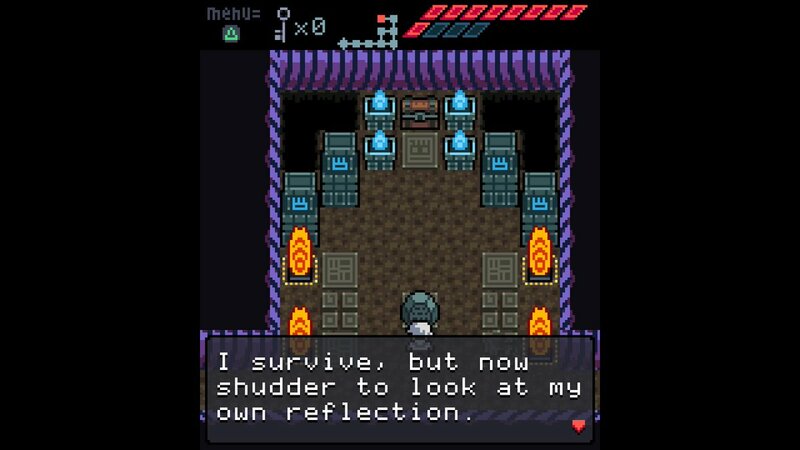 As a result, Anodyne avoids the usual Zelda convention of building dungeons around the usage of The New Item before tossing that item to barely get used again; I think the inspiration of Link’s Awakening was better about this than other games, but Anodyne avoids falling into that hole altogether. Instead, dungeons just build off of the core things you had at the beginning of the game, finding uses for the dust that Young can pick up, escalating the difficulty of jumping sections and introducing new types of puzzles entirely. Furthermore, boss battles aren’t an affair of using the new dungeon item to expose a weak point, but are straight up fights, which is more exciting, if a bit quick. Further comparing them, Anodyne leans far more into the surrealism, to the point that it creates an atmosphere that feels very uneasy. In the very first minute alone, the standard tutorial does not give advice, but issues commands, demanding that “you will do X.” As you move on, a shadowy figure stalks Young – but soon disappears forever. You soon meet a Sage, but the way he speaks to Young shows some level of contempt, showing that the trusted mentor figure may not have his best interests at heart. Heading into the world proper, everything seems like a by-the-book Zelda-like, if a bit weirder. And then Young accidentally (?) kills a person. The worlds that once seemed to logically connect get stranger as you go deeper, fantasy temples swapping out for modern architecture and surreal abstractions. It’s a world of uncertainty, and it doesn’t help that uncertainty surrounds Young himself. Bosses ramble to him as if they personally know him and areas and his actions hint toward a darker nature – or perhaps not. But uncertain doesn’t mean dangerous. Throughout the Land you find friendly NPCs that offer cryptic ramblings. While some of them add to the unease of the game’s atmosphere, plenty of NPCs are silly, going on weird tangents that come off as absurd, given the setting. Some of these tangents end up delving into something more personal and meaningful; the man right before the start of the hotel dungeon is perhaps my favorite NPC, as he goes on a sincere monologue that honestly brightens my day when I think about it. Anodyne‘s setting is a strange dream world that at times feels nightmarish, but dreams don’t always have to be bad. While I love the general tone of the game’s writing and it’s something I want to achieve one day, the actual main story itself is hard to follow. The story is actually at its clearest in the endgame areas, with much of the rest of the game feeling like you’re meandering about the place. This is a problem that’s actually addressed in a postmortem for the game, as it’s not immediately clear that the various characters and oddities you come across are representations of Young’s thoughts and it’s hard to peg what characters represent within the context they show up. 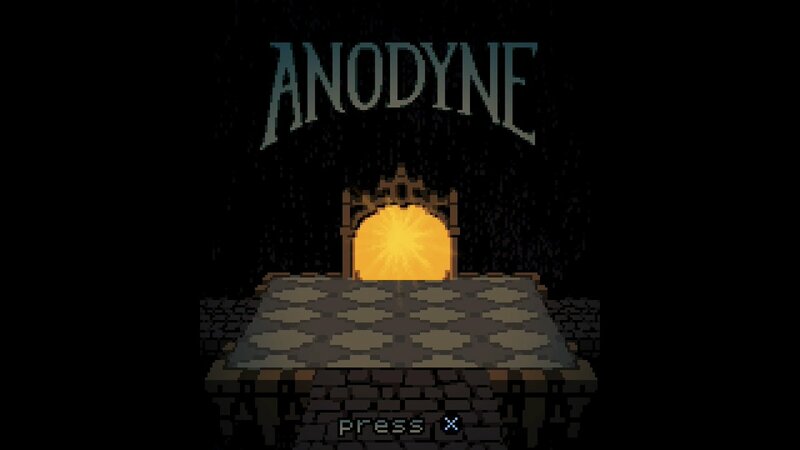 I do like mystery in games and it’s part of why I liked Yume Nikki and Lucah so much, but I feel that Anodyne went farther with it than it needed to. 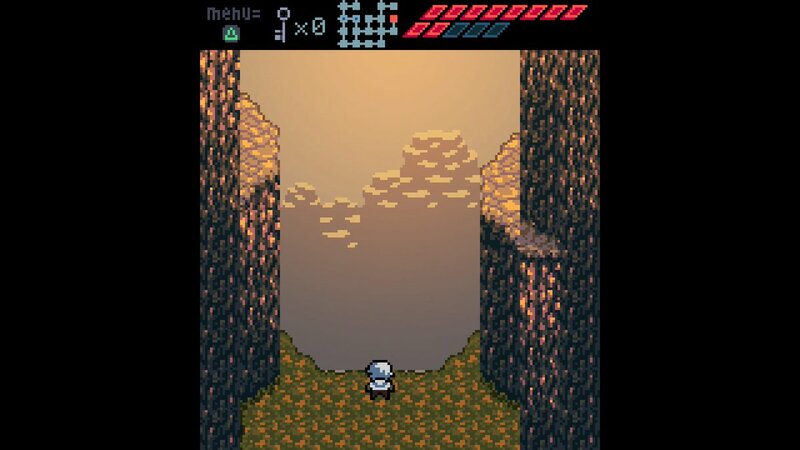 On the game’s aesthetics, Anodyne’s visuals is made up of pixel art with a retro palette, which is an interesting thing to look back on with the team’s later game, Even the Ocean, being a mix of sprites and painted environments. The art style’s still wonderful and the spritework is generally good, but what really sells the game’s world is the music. Sean’s music does a great job at establishing mood, from the dramatic ominous swells of the temple grounds to the energetic beats for the hotel to give this busy feel. There’s a general dreamy tone to much of the soundtrack, perhaps because of the soundfonts used, which fits the general setting of the game nicely. Now, how does Anodyne hold up in its PS4 port? For the most part, the game seems fine. I did have some slowdown issues, usually in rooms with a bunch of the four-shooter enemies, but it’s not frequent enough to be a huge concern. There’s also a weird problem with some trophies not dropping, if you’re into that; I theorize that maybe it depends on your online status, since I was hiding my status during the periods I didn’t get trophies. Personally, my biggest problem with the port is that the game is kept to match up with its original resolution, which while a good thing, also means that two-thirds of screen is just blank space; it’s weird for me, because I don’t think it’s a big deal when playing it as a computer game but it feels jarring to see that blank space on a tv screen. It kinda makes me wish for some nice border art, like maybe Marina illustrating a new take on Anodyne‘s world, since her art style’s evolved since Anodyne. Anodyne is as much of a good time as it was when I first played it all those years ago; the story’s still confusing to me, but the atmosphere of the Land is still delightful to take in. I’m honestly surprised that this game isn’t bigger than it is, especially in my circles, since it’s essentially an action-adventure Yume Nikki fangame. Hopefully with the PS4 and Xbox One ports, the game can find new audiences as Analgesic Productions works on the upcoming Anodyne 2: Return to Dust.